A case report has described the novel use of a stent for the removal of a foreign body from the cerebrovascular system. According to the authors, Mouhammed R Kabbani et al, the case was a man with a large left cavernous internal carotid artery cerebral aneurysm. 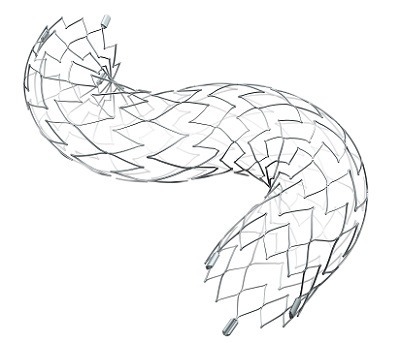 Primary coiling was initially attempted and when this failed, stent-assisted coiling was performed later on. During the primary coiling, a 10mmx40cm Complex Standard Penumbra coil (Penumbra) was used to frame the aneurysm. It prematurely detached and migrated into the anterior cerebral artery and could not be retrieved when negative suctioning was applied to the microcatheter (PX Slim, Penumbra). Kabbani and colleagues say that multiple failed attempts were made to retrieve the coil using 2mm and 4mm microsnares (Amplatz GooseNeck). Following these attempts the Trevo ProVue (Stryker) was used successfully. After the coil retrieval, a cerebral angiogram demonstrated a mild vasospasm of the distal pericallosal artery with no evidence of vascular injury or branch occlusion. “Strentrievers such as the Trevo ProVue and Solitaire (Covidien) are indicated for thrombectomy in acute ischaemic stroke. Because of their mechanical characteristics, they may be used as a reasonable additional tool […] to retrieve foreign bodies from the cerebrovascular system when other devices fail,” Kabbani et al say. Kabbani, speaking to NeuroNews says that in the future this device could be used more often for retrieval of foreign bodies in the cerebrovascular system but more case reports, such as his, are needed to support its use.